I’ve realised that I’ve spent a few posts talking about some of the smaller details of my life like my health and wellbeing, and trips and holidays I’ve taken, but I haven’t really spoken about some of the larger details of my life since it changed hugely in January of this year. Long-time readers of the blog have probably gathered that Tom and I separated in January. It was an incredibly painful and heartbreaking time and obviously I will keep the details private, however I will state that we are still good friends and I still have a lot of respect and care for him. We are sharing Bodhi the dog and we have him around 3-4 weeks each before he then goes to his other home. He is a hugely loved little doggy and he now has double the amount of cuddles, walks and people around him who love his little face. I should have him again within the next week or so and I can’t wait to give him a big squeeze. It’s tough but it’s been the logical thing to do since we both love him very much. We sold the lovely house in Lymington (goodbye roll-top bath – a sad day) and I moved to Southsea in August. I had been living at my parents for the first seven months of the year so it was amazing to finally have my own space again rather than trying to keep a houseful of things in one room. I will, however say that the time with my parents was wonderful and they looked after me so well – it was actually such good fun to be around them again and to wake up in the morning and have long chats with my Mum over breakfast. I grew up in this area so it really felt like coming home again, and though it was obviously an incredibly tough time, it was also a time when I focussed on healing and finding myself again – I even ended up having to take time off work but it was exactly what I needed to find my way out of that depression. I went for lots of walks on the beach with Bodhi, saw friends, read lots of books and watched lots of Netflix. (And caught up on lots of sleep). I’ve been living in Southsea for two months now. It’s very different to living in Lymington (as I write this I can hear police sirens in the distance) – in good ways and bad ways, like any situation. Southsea has lots of lovely coffee shops, independent bars and restaurants, the beautiful seafront and it’s easy to get the train into work. The area is quite different to anywhere I’ve lived before and there have been some issues with the neighbours and noise, but nothing you wouldn’t expect from living in a fairly student-y area just outside a city. 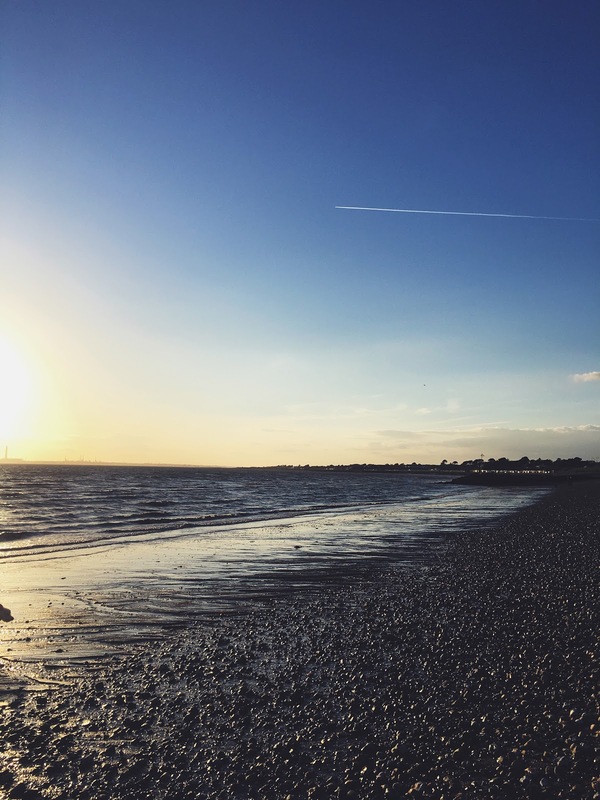 I’ve been spending my spare time in Southsea finding the best coffee shops, going for drinks and trying to get back into running and yoga. I’ve found a yoga class but though I’ve booked in twice I haven’t actually made it along yet for various reasons. I’m hoping to get back into a regular practice soon as I find it really makes a difference to my mental and physical health. It’s funny how you can know that something is really good for you and yet be useless at making time for it (monkey covering face emoji). At home I’ve been powering through my to-read list on my Kindle (I’ve been updating my Good Reads) – favouring trashy crime novels, self-help books, the picks from my work book club and anything else that takes my fancy! I’m going to write a blog post soon about some of the best ones I’ve read this year as I’ve come across some really life-changing non-fiction and some gripping fiction novels. I’m also still completely addicted to podcasts, particularly true crime podcasts. My current favourites are In Sight, Beyond Reasonable Doubt, The Trail Went Cold and Up and Vanished. Not much else is new – the last month or so has flown by in a flurry of hen do’s, weddings, trips to London, festivals and settling in to a new home. I can’t deny that my life looks very different to what I thought it would be at 33 but I’m healthy, have amazing friends and family and I’m working on finding happiness again. The last few months have given me the opportunity to start to get to know myself again and start a bit of a love affair with aromatherapy, crystals, Law of Attraction, shamanic healing and acupuncture (which I’m long overdue another appointment for!). I don’t know if I’ve shared too much in this update but I just wanted to write a little bit about where I am and what I’m doing. It’s been a funny old year so far, but it’s Autumn now, and how could you not be happy about that?